Lukou Town, Jiangning District, with a straight-line distance of 35.8km (22 miles) southeast to the center of Nanjing. Nanjing Lukou International Airport enjoys convenient transportation and serves as the key airport of China. It was built in February, 1995 and put into service on July 1, 1997. The terminal measures 132,000 square meters (16 square yards), with a 447,000 square meters (53 square yards) parking apron. The runway, on the other hand, measures 3,600-meter-long (3,937-yard-long). As an alternate airport to Shanghai Hongqiao International Airport and Shanghai Pudong International Airport, it now services to 45 domestic cities and 12 international cities, including Hong Kong, Macau, Bangkok, Singapore and Seoul. There are fifteen boarding bridges in the terminal building. From Jan. 30, 2016, the 144-Hour Visa-Free Policy has been implemented to enable passengers from some countries to enjoy a visa-free stay up to 144 hours when making an international transit via Lukou Airport, and passengers are allowed to travel in Nanjing, Zhejiang and Shanghai. Read details about 144-Hour Visa-Free Transit. 1.Check-in counters for domestic flights will be closed 30 minutes before scheduled flight departure time. Passengers are advised to be arrived at least 120 minutes before departure time to complete check in formalities. 2.Check-in counters for international flights will be closed 30~60 minutes before scheduled flight departure time. Passengers are advised to be arrived at least 150~180 minutes before departure time to complete check in formalities. Taxi services are available 24 hours on the first floor of the Arrival Terminal. Below is a reference list of taxi fare from Lukou International Airport to down town area. By Metro: Metro Line S1 transfers passengers between the airport and South Railway Station. Restaurants: Six restaurants and teahouses are conveniently located in the Departure Hall, the Arrival Hall and at the Concourse. Chinese food, tea, specialty buffet dinners as well as Western food are available. Shops: There are 11 shops spread across the Departures Hall, the Arrival Hall and the Concourse for the sale of bags, apparels and other local products like Salted Soup Ducks, Cloud Brocades, Yuhua Tea and Rain Flower Stones (Yuhua Shi), etc. Three duty-free shops in the International Restricted Area of the Departures Halls (Level 1) deal with cigarettes, alcohols, watches, perfumes, leather goods and attires of over 10 world top brands. Bookstore: There are three bookstores in the restricted area at the Departure Hall, two in the Departure Hall and one in the Arrival Hall. Entertainment Center: Zhong Tu Meng Tuan Foot Bath Center occupies two lots, one on the fourth floor at the Departure Hall and one on the first floor at the Arrival Hall, providing foot bath service. There is also a gym lottery sale office and one welfare lottery sale office on the first floor at the Arrival Hall. Car Park: As the largest outdoor car park of Jiangsu Province, the airport public car park offers over 1,800 parking spaces in a total area of 30,000 square meters (7 acres). 24-hour parking service is available in the designated area. There is also a VIP car park on the right side of the Terminal building offering about 100 parking spaces for VIP to make a short parking period. Banks: Branches of Bank of China and China Construction Bank can be found on the Departures Hall, with ATMs equipped for the convenience of passengers. 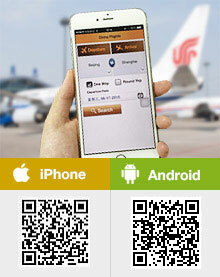 China Mobile:Two VIP lounges of China Mobile provide considerate services in the Restricted Area, Level 3. Telephone:One can find inside the terminal a wide distribution of IC-card telephones and also 10 automatic IC cards vending machines. is there a lounge at Nanjing Airport? As I know, there are lounge at the airport. You can take some rest there. Upon landing, you can easily find the place based on the detailed English signs at the airport. Good day. I am arriving at Nanjing Lukou International Airport on 24/02/2019 at 2220hrs. ADD: furuite shoes ,chuan qing town,gaoyou city ,jiangsu province. Is it possible to get a taxi to there at that time or i will have to sleep in Nanjing and catch a bus the following morning? Thank you Riley. Much appreciated.. If I spend the night are there any hotels around the airport? My arrival at Nanjing Airport 2230hrs by MH, is there any public transport to town? Yes, there are two airport shuttle bus Line 1 and Line 2 available to the downtown when you arrive at the airport. The buses will make many stops along the way. Don't worry. From hotel Jinjiang Inn - Zhonghuamen to NKG Nanjing international airport. Need to know if early morning Taxi can get or not. Yes, you'd better reserve one taxi online in advance and the driver picks you up at the hotel and then head to the airport. The most convenient way is that you ask the hotel you live in to help you book one. How much time taxi take from Junking Inn - Zhonghuamen to Nanjing international airport NKG? About 30 - 40 minutes.